Neal N. Cheng of the University of California introduces a new concept he calls chemical enhancement as the increased yield of a chemical reaction due to the chemical properties of the added materials. 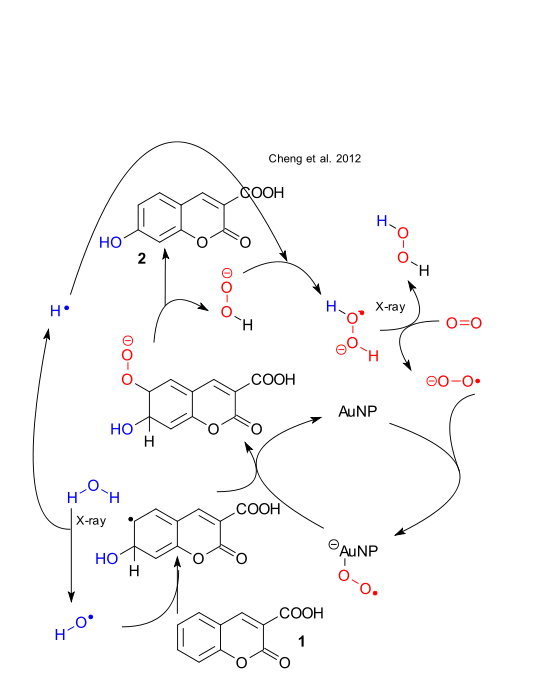 The context is the hydroxylation of coumarin-3-carboxylic acid (3CCA) in water catalysed by gold nanoparticles (AuNP). The focus is the effect of X-ray irradiation during this reaction. Due to its high atomic number gold is efficient in X-ray absorption. In biology these irradiated gold particles manifest themselves as producers of reactive oxygen species by radiation re-emission but in this particular reaction Cheng argues gold is doing more than just that. In a typical experiment 3CCA was dissolved in phosphate buffer and DMSO, A AuNP solution (30 nm diameter, PEG coated, Turkevich_method, Sodium borohydride assisted) was added and the mixture irradiated at 3 to 40 Gy per minute. Formation of hydroxylated product was easily monitored by fluorescence as the 3CCA starting material is only weakly fluorescent. Sure enough the enhancement of the fluorescence signal (against control without AuNP added) increases with increased radiation dose. Making the gold particles smaller will increase the signal but adding more gold will only enhance the signal up to a certain concentration. According to Cheng this implies that a rate-limiting agent is in play. Sodium azide does not affect the enhancement ruling out singlet oxygen but superoxide dismutase known to scavenge superoxide does. But how are we to understand chemical enhancement? Is the phenomenon really new? This blog is having some doubts. No explanation is given for chemical enhancement other than that it is the difference between the observed enhancement and the physical enhancement you can predict to result from simple radiation (ROS yield). A more reasonable explanation is a simple synergy effect between various oxygen species and available metal surface. Each modification of the experimental setup will bring about a change in the ROS line-up and the mechanism completely changes. And by the way, from the supporting information: will the enhancement increase or decrease when you remove oxygen? Answer: increase! The Global Warming Scare provides a bonanza for various trades & industries, chemistry one of them. Chemists all over the world busy themselves with a wide range of topics such as new battery design, solar cells, carbon sequestration and notably carbon dioxide recycling. The latest initiative originates from Das Neves Gomes et al. of a French organisation curiously called CEA, IRAMIS, SIS2M, CNRS UMR 3299 (DOI). They step away from systems using hydrogen as CO2 reducing agent because that inevitably introduces a metal catalyst, see for example one described here. Instead they opt for phenylsilane as hydrogen source because now they can replace the metal with an organocatalyst such as 1,5,7-Triazabicyclo(4.4.0)dec-5-ene. In one model system carbon dioxide is reduced with 0.05 equivalent of the base, 1 equivalent of another base such as morpholine, 1 equivalent of phenylsilane at 100°C (no solvent) and 100% yield. the reaction products are N-formyl-morpholine and phenylsilane that will eventually wind up as a silsesquioxane. Ohm's law (current proportional to voltage) was first formulated in 1827 and the discoverer George Ohm would be pleased to know that in 2012 the law still holds even at the smallest possible nanoscale. Weber et al. in their report in Science (DOI) do not explain how they would expect conductors to behave in another way at this nanoscale but ventured ahead anyway to create a truly tiny electrical wire, run a current through it and measure resistivity. A silicon wire 100 nanometers in length, just 4 atoms wide and one atom in height was deposited on silicon by scanning probe lithography (basically patterning the wire one silicon atom at the time). The surface was then doped with phosphine (PH3). The SEM image displayed in the report shows neat rows of silicon dimers topped with PXn molecules and the authors suggest you can distinguish between PH and PH2 molecules. Phosphorus forms P-Si bonds with P atoms on average separated by one nanometer which makes the wire a binary PS compound. The whole surface is then covered in more silicon (molecular beam epitaxy) completing the production process. Yes, at 4 Kelvin a linear relationship between current and voltage can be reproduced (good news for George) and even a linear relationship between wire length and resistivity. It is curious though that for the construction of the last plot data points are included from an earlier 2007 study (DOI). Nothing wrong with it but that 2007 study also concluded that Ohm's law holds. So how many times can you announce to the world Ohm's Law holds in nanowires? Adriano Ambrosi of the Nanyang Technological University has a sobering message for all those involved in graphene research: the graphene you are working with may be contaminated with metals and these metals may seriously affect the graphene properties you are investigating (DOI). Sounds like the Its-the-contaminants-stupid! discussion al over that deals with organic reactions that may take place without any metal catalyst or take place with a hidden (or ignored) metal payload. Here are the specifics: regular graphite is known to contain metal impurities, in the top-down approach, graphite is oxidized with strong acids to produce graphite oxide which is then exfoliated and reduced by shock treatment at 1000°C to form single-layer graphene sheets. Ambrosi demonstrates that the metal content (Co,Cu,Fe,Mo,Ni) goes up rather than down in this process with copper at 60 ppm in the final product. A cyclic voltammetry plot of the graphene as an electrode against cumene hydroperoxide then gives an indication how the electrochemical properties are affected. Whereas the reference electrode made from glassy carbon starts reducing the peroxide at -0.6 V, the graphene electrode already does so at -0.2 V indicating electrocatalysis. Not all bad new though: the bottom-up approach towards graphene using chemical vapor deposition should be okay. A large Germany-based team (Stefan Grimme of FLP fame among them) report a record 12-step cascade reaction (Dückert et al. 2011 DOI) in their quest for novel (medicinal?) indoloquinolizines. They like to call their effort biology-oriented synthesis because nature just loves cascade reactions in the construction of really large and complex molecules. The reaction takes place in a single vessel and starts off with three reagents. 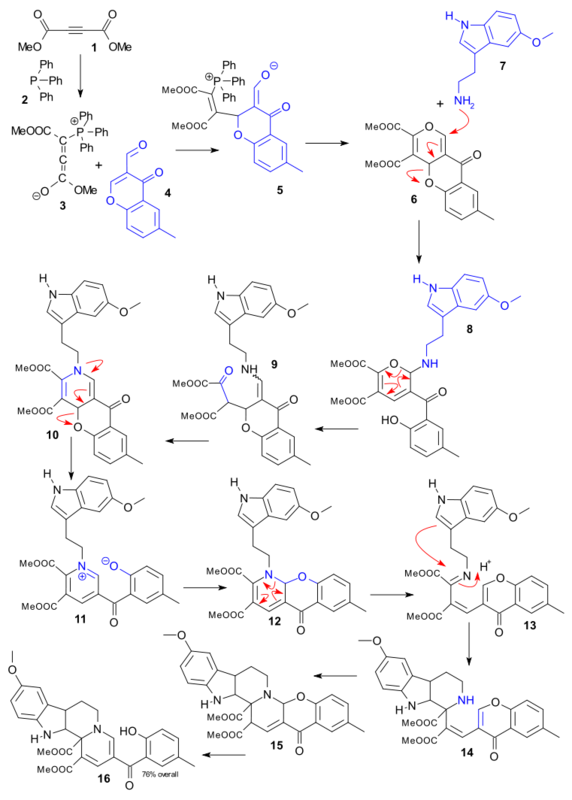 At a later stage a fourth and fifth are added which, considering the definition of a cascade reaction (all-in-one intramolecular reaction) technically makes it a combined 4 and 8-step cascade. The 12-steps combined takes us through a whole catalogue of reaction mechanisms and here we go: Dimethyl acetylenedicarboxylate 1 reacts with triphenylphosphine 2 to zwitterion 3 which then reacts with chromone 4 to adduct 5 by alkylation. 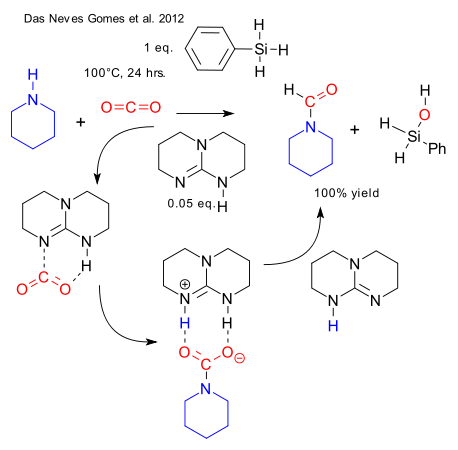 Phosphine is eliminated and the ring is closed in 6, amino indole 7 and camphorsulfonic acid are then added forming 8 in a conjugate N-alkylation, the pyran opens and O addition gives intermediate 9, amine-carbonyl condensation gives dihydropyridine 10, ring opening and Pyridinium rearomatisation gives 11, nucleophilic aromatic addition of oxygen gives 12, an aza-claisen rearrangement gives 13, a Pictet-Spengler reaction gives 14,an aza-michael addition gives 15 and finally a retro-Michael addition gives 16. The reaction takes up to 30 minutes with an overall 76% yield. And a happy 2012 to you too. To start the new year have a look at the image on the left (click it for a blowup). With thanks to Flowingdata for the chem alert, this image (2009) is brought to you by Bollen et al. (DOI) from the Digital Library Research division (fascinating) of the Los Alamos National Laboratory (didn't they used to do atomic bombs?). It is a map of science with each dot representing a particular scientific branch grouped into clusters and with all the connecting lines. On the right you can see all the hard-core science departments (physics, chemistry) while on the left you can see all the womanly things like sociology and nursing. To compile the image, over 1 billion logfile entries were collected from science portals such as Web of Science and Scopus. These data reveal what people read rather then what people cite. people that read the JORG also tend to read tetrahedron but to a lesser extent the Angewandte or even Foreign Policy. The scientific principle is a Markov chain. The chemistry block is flanked by the physics block and the biochemistry block. For chemistry there are three ways get across the big scientific void into the left side: in one direction though manufacturing and product research venturing into economics and in another direction through plant biology and environmental science. One direct route seems to lead directly from analytical chemistry to religion (?) and another one from organic chemistry into international studies (?). The study was not limited to scientific journals: newspapers like the New York Times were also included. This raises an interesting question: considering the political orientation that newspapers have, are chemists more conservative than geologists or are analytical chemists more left-wing than organic chemists? What political orientation do climate scientists have? The answer is all in the data, ready to be mined.